1. Hsuan, K. 1978. Orders and Families of Malayan Seed Plants. Singapore University Press: Singapore. 5. Wiart, C. 2006. 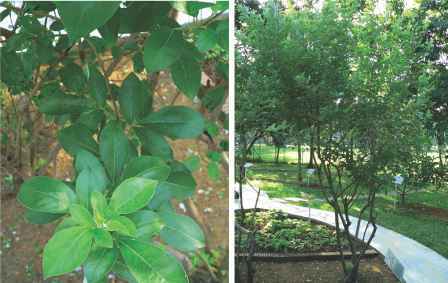 Medicinal Plants of the Asia-Pacific: Drugs for the future? World Scientific Publishing Co. Pte. Ltd.: Singapore. 6. Ishiguro, K., Ohira, Y. and Oku, H. 1998. Journal of Natural Products 61: 1126-1129. 7. Ishiguro, K., Oku, H. and Kato, T. 2000. Phytotherapy Research 14: 54-56. 8. Oku, H. and Ishiguro, K. 2002. Biological and Pharmaceutical Bulletin 25: 658-660. 9. Shoji, N., Umeyama, A., Saitou, N., Yoshikawa, K., Nagai, M. and Arihara, S. 1994. Chemical and Pharmaceutical Bulletin 42: 1422-1426. 10. Shoji, N., Umeyama, A., Yoshikawa, K., Nagai, M. andArihara, S. 1994. Phytochemistry 37: 1437-1441. 12. Yang, X., Summerhurst, D. K., Koval, S. F., Ficker, C., Smith, M. L. and Bernards, M. A. 2001. Phytotherapy Research 15: 676-680. 13. Choi, S. C. and Jung, J. S. 1999. Journal of the Korean Fiber Society 36: 338-343. 14. Lim, Y. H., Kim, I. H. and Seo, J. J. 2007. Journal of Microbiology 45: 473-477. 15. Tailor, R. H., Acland, D. P., Attenborough, S., Cammue, B. P., Evans, I. J., Osborn, R. W., Ray, J. A., Rees, S. B. and Broekaert, W. F. 1997. Journal of Biological Chemistry 272: 24480-24487. 16. Ishiguro, K., Ohira, Y. and Oku, H. 2002. Biological and Pharmaceutical Bulletin 25: 505-508. 17. Oku, H. and Ishiguro, K. 1999. Phytotherapy Research 13: 521-525. 18. Thevissen, K., François, I. E., Sijtsma, L., van Amerongen, A., Schaaper, W. M., Meloen, R., Posthuma-Trumpie, T., Broekaert, W. F. and Cammue, B. P. 2005. Peptides 26: 1113-1119. 19. Oku, H. and Ishiguro, K. 2001. Phytotherapy Research 15: 506-510.